IL-15 plays many important roles within the immune system. IL-15 signals in lymphocytes via trans presentation, where accessory cells such as macrophages and dendritic cells present IL-15 bound to IL-15Rα in trans to NK cells and CD8+ memory T cells expressing IL-15/IL-2Rβ and common γ chain (γc). Previously, we showed that the prophylactic delivery of IL-15 to Rag2−/−γc−/− mice (mature T, B, and NK cell negative) afforded protection against a lethal HSV-2 challenge and metastasis of B16/F10 melanoma cells. In this study, we demonstrated that in vivo delivery of an adenoviral construct optimized for the secretion of human IL-15 to Rag2−/−γc−/− mice resulted in significant increases in spleen size and cell number, leading us to hypothesize that IL-15 signals differently in myeloid immune cells compared with lymphocytes, for which IL-15/IL-2Rβ and γc expression are essential. Furthermore, treatment with IL-15 induced RANTES production by Rag2−/−γc−/− bone marrow cells, but the presence of γc did not increase bone marrow cell sensitivity to IL-15. 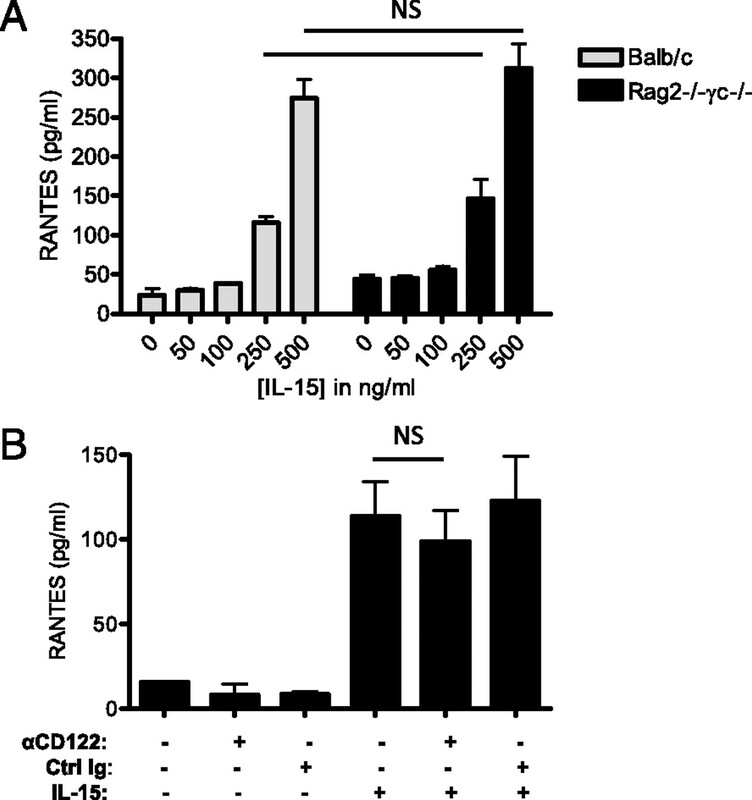 This IL-15–mediated RANTES production by Rag2−/−γc−/− bone marrow cells occurred independently of the IL-15/IL-2Rβ and Jak/STAT pathways and instead required IL-15Rα signaling as well as activation of JNK and NF-κB. Importantly, we also showed that the trans presentation of IL-15 by IL-15Rα boosts IL-15–mediated IFN-γ production by NK cells but reduces IL-15–mediated RANTES production by Rag2−/−γc−/− myeloid bone marrow cells. Our data clearly show that IL-15 signaling in NK cells is different from that of myeloid immune cells. Additional insights into IL-15 biology may lead to novel therapies aimed at bolstering targeted immune responses against cancer and infectious disease. Interleukin-15 exerts a variety of effects on a number of cell types within the innate and adaptive arms of the immune system. IL-15 is crucial for the survival, maintenance, and function of NK cells, CD8+ memory T cells, and CD8αα+ and TCR γδ+ intestinal intraepithelial lymphocytes (1–4) and promotes the functional maturation of macrophages and dendritic cells (DCs) upon microbial infection (5). IL-15 also is important for promoting DC survival (6), delaying apoptosis in bone marrow cells of lymphoid origin (7), and stimulating the proliferation of follicular DCs and myeloid (CD11b+) and lymphoid (CD11b−) bone marrow cells (7, 8). IL-15 signals are delivered via a heterotrimeric receptor complex. Along with its private IL-15Rα subunit, which is required for high-affinity IL-15 binding, the IL-15R complex also contains a β subunit (IL-15/IL-2Rβ), which IL-15 shares with IL-2, and a common γ chain (γc) (9–11). In order for IL-15 signaling to occur in NK cells and CD8+ T cells, expression of IL-15/IL-2Rβ and γc by responding cells is crucial (2, 11–13). IL-15 signaling in NK cells and CD8+ T cells occurs via trans presentation, where accessory cells such as macrophages and DCs present IL-15 bound to IL-15Rα in trans to NK cells and CD8+ T cells expressing IL-15/IL-2Rβ and γc (1, 2, 14–16). During IL-15–mediated activation of Jak/STAT signaling in NK cells and CD8+ T cells, Jak1 and Jak3 mediate the phosphorylation of STAT3 and STAT5, respectively (9, 13, 17–19). IL-15 also signals through pathways involving, but not limited to, the phosphorylation of spleen tyrosine kinase, PI3K, Src family tyrosine kinases, and MAPKs (9), including JNKs (20), and the activation of NF-κB (17, 21). IL-15 signaling has been shown to induce myeloid cell production of a number of cytokines and chemokines, including MCP-1 (22), IL-12 (5), and TNF-α (23). IL-15 signaling in vivo, particularly mediated by IL-15Rα, also has been shown to be critical for RANTES production (24). In a murine model of 2,4-dinitro-1-fluorobenzene (DNFB)-induced contact hypersensitivity, DNFB-treated IL-15Rα−/− mice displayed a significant reduction in inflammation and local production of RANTES compared with those of DNFB-treated wild-type mice (24). IL-15 stimulation of T cells also has been shown to induce RANTES production in a dose-dependent fashion in vitro (25), and the inhibition of IL-15 signaling in human follicular DCs caused a significant decrease in the production of RANTES by these cells (8). Despite the requirement for IL-15/IL-2Rβ and γc for IL-15 signaling in CD8+ T cells and NK cells, we have demonstrated previously that IL-15 can signal in vivo in the absence of γc. The prophylactic delivery of rIL-15 to the vaginal tracts of female Rag2−/−γc−/− mice afforded protection against subsequent lethal challenge with HSV-2 (26). In addition, the prophylactic delivery of an adenoviral construct expressing IL-15 protected Rag2−/−γc−/− mice against lung metastasis after an injection with B16/F10 melanoma cells (27). Because Rag2−/−γc−/− mice genetically lack mature T, B, and NK cells, we chose to examine whether IL-15 signals in myeloid cells in the absence of γc. We have demonstrated that IL-15 induces RANTES production by bone marrow cells from Rag2−/−γc−/− mice and that this IL-15 signaling occurs independently of IL-15/IL-2Rβ and γc. We have shown further that IL-15–mediated RANTES production is not dependent on the activation of Jak/STAT and instead requires IL-15Rα, JNK, and NF-κB signaling. In addition, we showed that trans presentation of IL-15 attenuated IL-15–mediated RANTES production by Rag2−/−γc−/− myeloid bone marrow cells but boosts IL-15–mediated IFN-γ production by NK cells. To our knowledge, this is the first report demonstrating that IL-15 can signal in myeloid cells in the absence of γc and requires IL-15Rα, JNK, and NF-κB signaling. Future studies investigating IL-15 signaling in myeloid cells may reveal novel signaling paradigms in these cell types. Breeding pairs of Rag2−/−γc−/− mice on a BALB/c background were a gift from M. Ito (Central Institute for Experimental Animals, Kawasaki, Japan). Rag2−/− mice on a BALB/c background and wild-type BALB/c mice were purchased from Charles River Laboratories (Quebec, QC, Canada). Mice were bred and housed under specific pathogen-free conditions at the Central Animal Facility at McMaster University. Experiments were conducted in accordance with the ethical guidelines outlined by the Canadian Council on Animal Care and followed the animal utilization protocol of McMaster University. Eight- to 12-wk-old female mice were sacrificed by cervical dislocation. Tibias were removed, and single-cell suspensions were prepared. RBCs were lysed using 2 ml ammonium chloride potassium lysis buffer for 2 min. Bone marrow cells were incubated in RPMI 1640 media (endotoxin-free) containing 10% FBS, 1% HEPES, 1% l-glutamine, 1% penicillin/streptomycin, and 0.1% 2-ME (10% complete) for 3 h at 37°C, and adherent cells were scraped gently into fresh 10% complete RPMI 1640 medium. Cell viability was determined using trypan blue exclusion, and viable cells were enumerated using a hemocytometer. An adenoviral construct optimized for the secretion of human IL-15 was generated as described previously (27). Recombinant murine (rm) IL-15 [endotoxin level is <0.1 ng/μg of protein (<1 endotoxin unit/μg)] was purchased from PeproTech (Rocky Hill, NJ), and rmIL-15Rα was purchased from R&D Systems (Minneapolis, MN). Soluble rmIL-15/rmIL-15Rα complexes were generated by incubating rmIL-15 and rmIL-15Rα in a minimal volume at a ratio of 1:2 by weight for 45 min at 37°C. Mouse IFN-γ and RANTES DuoSet ELISA kits (detection limit of 31.25 pg/ml) were purchased from R&D Systems (Minneapolis, MN). All of the ELISAs were performed on cell-free supernatants according to the manufacturer’s instructions. Bone marrow cells and splenocytes from naive Rag2−/−γc−/− mice were stained with PE-Cy7–labeled anti-mouse CD11b Ab (eBioscience, San Diego, CA) and Alexa Fluor 700-labeled anti-mouse GR-1 Ab (eBioscience) for 30 min according to the manufacturer’s instructions. Cells then were run on a LSR II flow cytometer (BD Biosciences, San Jose, CA), and data were analyzed according to fluorescence minus one (FMO) staining controls using FlowJo software (Tree Star, Ashland, OR). The following blocking Abs and inhibitors were used to target specific components of downstream IL-15 signaling: rat anti-CD122 (IL-15/IL-2Rβ) Ab (TM-β1 clone; AbD Serotec, Raleigh, NC), rat anti-IL-15Rα Ab (RM0103-6C38 clone; Abcam, Cambridge, MA), Jak Inhibitor I (Calbiochem, Merck, Whitehouse Station, NJ), PD98059 (MEK1/2 inhibitor; Calbiochem), SB203580 (p38 inhibitor; Calbiochem), SP600125 (JNK inhibitor; Sigma-Aldrich Canada, Oakville, ON, Canada), and BAY 11-7082 (NF-κB inhibitor; Calbiochem). Rat IgG2a and rat IgG2b (eBioscience) were included as control Igs. Lentiviral vectors were purchased from Sigma-Aldrich (St. Louis, MO). Murine IL-15Rα short hairpin RNA (shRNA) vector accession numbers are: NM_133836.1-931s1c1, NM_133836.1-515s1c1, NM_133836.1-567s1c1, NM_133836.1-653s1c1, and NM_133836.1-398s1c1. The Non-Target shRNA Control was used as a control (SHC002; Sigma-Aldrich). shRNA vectors were cotransfected into HEK293T cells with the lentivirus packaging plasmids PLP1, PLP2, and PLP-VSVG (Invitrogen, San Diego, CA) using Lipofectamine 2000 (Invitrogen). Supernatants were collected 48 and 72 h posttransfection, passed through a 0.45-μm nitrocellulose filter, and kept frozen at −80°C until use. Bone marrow cells from Rag2−/−γc−/− mice were cultured in 24-well tissue culture plates at a concentration of 5 × 105 cells/ml. Cells were infected with a lentiviral vector containing IL-15Rα shRNA or control vectors at a multiplicity of infection of 1.0 at 37°C for 16 h. The culture plates were washed, replaced with fresh medium, and stimulated with rmIL-15 (250 ng/ml) for 24 h. Cell-free supernatants were collected and measured for RANTES production by ELISA. To evaluate the knockdown of IL-15Rα, lentiviral vector-infected Rag2−/−γc−/− bone marrow cells were stimulated with rmIL-15 and stained with carboxyfluorescein-labeled anti-mouse IL-15Rα Ab (R&D Systems) and PE-Cy7–labeled anti-mouse CD11b Ab (eBioscience) for 30 min according to the manufacturer’s instructions. Cells then were run on a LSR II flow cytometer, and data were analyzed according to FMO staining controls using FlowJo software. Bone marrow cells were stimulated with 100 ng/ml LPS (Sigma-Aldrich Canada) or 250 ng/ml rmIL-15, transferred onto glass slides by Shandon Cytospin 4 (Thermo Electron, Waltham, MA), dried, and fixed with cold acetone. Cells were blocked in PBS + 5% BSA supplemented with 5% normal goat serum and 0.1% Triton X-100, washed with PBS + 0.05% Tween 20, and incubated with anti-NF-κB Ab (c-20 clone; Santa Cruz Biotechnology, Santa Cruz, CA) overnight at 4°C. Cells were incubated with 1.5 μg/ml Alexa Fluor 488-conjugated goat anti-rabbit secondary Ab (Invitrogen) in the dark, and nuclei were counterstained with propidium iodide (1:3000 dilution in PBS + 0.05% Tween 20) for 5 min. After a final wash step, one drop of Vectashield hard-set mounting medium (Vector Laboratories, Burlington, ON, Canada) was added, and the cells were covered and dried. Images were captured using a LSM 510 (inverted) confocal microscope (Zeiss, Oberkochen, Germany) using a ×63 objective. Images were analyzed using LSM 510 software, version 3.2 (Zeiss). Bone marrow cells isolated from Rag2−/−γc−/− mice were treated with rmIL-15 (250 ng/ml) for 0, 2, 4, and 6 h, and nuclear proteins were extracted following a method as described previously (28). Briefly, the cell pellets obtained with ice-cold lysis buffer were lysed further with high-salt lysis buffer [20 mM HEPES (pH 7.6), 420 mM NaCl, 25% glycerol, 1.5 mM MgCl2, 50 mM NaF, 1 mM PMSF, 0.5 mM DTT, 1 mM NaVO3, 2% SDS, and a protease inhibitor mixture] and centrifuged at 15,000 × g for 20 min at 4°C, and the supernatants were collected as nuclear proteins. Protein concentrations were measured by standard Bradford assays. Equal amounts (30 μg) of protein were separated by 10% SDS-PAGE and electroblotted onto polyvinylidene difluoride membranes (Millipore, Billerica, MA). After being blocked in 5% skimmed milk, membranes were incubated with NF-κB/p65 Ab (Santa Cruz Biotechnology) overnight at 4°C and probed with a HRP-conjugated corresponding secondary Ab. The protein bands were detected using an ECL kit (Pierce, Rockford, IL). The membranes were stripped and reprobed with β-actin Ab (Abcam) to verify equal loading of nuclear proteins. Total RNA from IL-15–stimulated Rag2−/−γc−/− bone marrow cells was isolated using TRIzol reagent (Invitrogen, Burlington, ON, Canada) according to the manufacturer’s protocol. RNA samples then were purified by DNA-free kit (Ambion, Streetsville, ON, Canada). cDNA was synthesized with 1 μg of RNA using Moloney murine leukemia virus reverse transcriptase (Invitrogen) according to the manufacturer’s instructions. Quantitative PCR was performed in triplicate using SYBR Green SuperMix (Applied Biosystems, Carlsbad, CA) in a 20-μl reaction with predesigned primers for mouse RANTES (forward, 5′-CAT ATG GCT CGG ACA CCA-3′; reverse, 5′-ACA CAC TTG GCG GTT CCT-3′) and 18S rRNA (forward, 5′-GTG CAT GGC CGT TCT TAG TT-3′; reverse, 5′-TGC CAG AGT CTC GTT CGT TAT-3′), following the manufacturer’s directions, in a AB7700 sequence detection system. Data were analyzed using the comparative threshold (Ct) cycle method (Applied Biosystems). The difference in cycle times (ΔCt) was determined as the difference between the target gene (RANTES) and the reference housekeeping gene (18S rRNA). Results were expressed as the fold increase after IL-15 stimulation compared with untreated control cells. Rag2−/−γc−/− bone marrow cells and purified NK cells from spleens of B6 mice (using murine NK cell isolation kit from StemCell Technologies, Vancouver, BC, Canada) were grown in 10% RPMI 1640. Cells were stimulated with rmIL-15, rmIL-15Rα, and soluble rmIL-15/rmIL-15Rα complexes at the indicated concentrations for 24 h at 37°C. Cell-free supernatants from bone marrow cells and NK cells were collected and assayed for RANTES and IFN-γ production, respectively, by ELISA. Statistical analysis was performed using Prism software, version 4 (GraphPad, San Diego, CA). One-way ANOVA and Tukey posttests were used to compare cytokine production by bone marrow cells in inhibitor/blocking Ab studies. RANTES production by Rag2−/−γc−/− bone marrow cells after IL-15 stimulation was compared with that of unstimulated cells at each time point and to BALB/c bone marrow cells using separate unpaired t tests. Data on bar graphs are presented as mean ± SEM. A p value of <0.05 was interpreted to be statistically significant. Despite the requirement for γc for IL-15 signaling to occur in NK cells and CD8+ T cells, our laboratory has shown previously that IL-15 can exert antiviral and anticancer effects in the absence of γc (26, 27). After the administration of an adenoviral construct expressing human IL-15 to Rag2−/−γc−/− mice, we also observed an increase in spleen size, total number of splenocytes (with an increase in CD11b+ population), and RANTES production by bone marrow cells compared with those of mice receiving control adenovirus or PBS (Fig. 1A–C). Flow cytometry analysis of splenocytes from naive Rag2−/−γc−/− mice revealed high expression of CD11b and GR-1, and virtually all of the CD11b+ cells coexpressed GR-1 (Fig. 1D, upper panel). The Rag2−/−γc−/− bone marrow cell population was more homogenous, because >90% of the total cell population was CD11b+GR-1+ (Fig. 1D, lower panel). We used bone marrow cells from Rag2−/−γc−/− mice for all of the future experiments, because the cell yield is higher compared with that of splenocytes (∼20 million versus ∼1 million/mouse, respectively). Next, we chose to examine whether IL-15 can signal in vitro in the absence of γc by measuring rIL-15–induced RANTES, IL-12, and MCP-1 production by myeloid cells from Rag2−/−γc−/− mice. IL-15 treatment leads to increased spleen weight, number of splenocytes, and RANTES production by bone marrow cells in vivo in the absence of γc. Rag2−/−γc−/− mice were injected i.v. via the tail vein with 5 × 108 PFU of an adenoviral construct optimized for the secretion of human IL-15 (AdhIL-15) (n = 5), 5 × 108 PFU adenoviral vector control (n = 5), and PBS (n = 5). Mice were sacrificed on day 8 posttreatment, spleens were harvested and weighed, and viable splenocytes were enumerated using a hemocytometer. Spleen weights are shown in (A). Splenocyte counts are presented in (B). Data are shown as mean ± SEM. Experiments were repeated twice, each time with n = 5 mice/group, and similar results were achieved each time. (C) Bone marrow cells from Rag2−/−γc−/− mice injected i.v. with 5 × 108 PFU of an adenoviral construct optimized for the secretion of human IL-15, 5 × 108 PFU adenoviral vector control, and PBS (n = 5/group) were seeded at 3 × 105 cells/well, cultured for 24 h, and assayed for RANTES production by ELISA. Data are shown as mean ± SEM. (D) Live splenocytes (upper panels, from four naive Rag2−/−γc−/− mice) and bone marrow cells (lower panels, from three naive Rag2−/−γc−/− mice) were analyzed for cell surface expression of CD11b and GR-1 using fluorescent Ab staining and flow cytometry. Expression of markers was analyzed according to FMO staining controls. Experiments were performed once with representative data for each tissue shown from one mouse. **p < 0.01, ***p < 0.001. Because IL-15 signaling has been shown previously to be important for IL-12 and MCP-1 production by myeloid cells (5, 22), we asked whether IL-15 stimulation would induce the production of these cytokines by γc-deficient Rag2−/−γc−/− myeloid cell populations. We observed no induction of IL-12p40 or MCP-1 production by spleen or bone marrow cells from Rag2−/−γc−/− mice after IL-15 stimulation (data not shown). On the basis of our in vivo findings in Fig. 1C and data from published studies documenting the importance of IL-15 signaling for RANTES production by T cells and DCs (8, 24, 25), we next sought to determine whether IL-15 induces RANTES production by Rag2−/−γc−/− bone marrow cells in vitro. We observed a significant increase (p < 0.001 to p < 0.01) in the level of RANTES protein in culture supernatants of IL-15–treated adherent bone marrow cells from Rag2−/−γc−/− mice, Rag2−/− mice, and BALB/c mice (Fig. 2A, 2B). We also completed a time-course experiment to investigate whether RANTES is preformed within the cell and released upon IL-15 stimulation or IL-15 instead induces de novo RANTES production by Rag2−/−γc−/− bone marrow cells. We detected an increase in the level of RANTES protein (p < 0.01) in culture supernatants beginning at 6 h after IL-15 treatment (Fig. 2C). Interestingly, there was no increase in RANTES protein above background in culture supernatants from Rag2−/−γc−/− bone marrow cells treated with IL-15 for 2 and 4 h (Fig. 2C). Finally, we examined the time course of IL-15–mediated RANTES production by Rag2−/−γc−/− bone marrow cells at the mRNA level using quantitative RT-PCR. We observed a significant induction in RANTES mRNA, after 2 h (p < 0.05) and 4 h (p < 0.01) of IL-15 treatment, which dramatically diminished after 6 h of IL-15 treatment (p > 0.05) (Fig. 2D). γc signaling is not required for IL-15–mediated RANTES production. (A) Adherent bone marrow cells from female Rag2−/−γc−/− mice (n = 5) and wild-type BALB/c mice (n = 5) were seeded at 3 × 105 cells/well and stimulated in triplicate with 250 ng/ml rmIL-15 for 24 h at 37°C. Cell-free supernatants were collected and analyzed by ELISA for the production of RANTES. Experiments were performed twice with representative data shown as mean ± SEM. (B) Bone marrow cells from Rag2−/−γc−/− mice (n = 3) and Rag2−/− mice (n = 3) were seeded at 3 × 105 cells/well and stimulated in triplicate with 250 ng/ml rmIL-15 for 24 h at 37°C. Cell-free supernatants were collected and analyzed by ELISA for the production of RANTES. Data shown are mean ± SEM of two independent experiments. (C) Bone marrow cells from female Rag2−/−γc−/− mice (n = 3) were seeded at 3 × 105 cells/well and stimulated in triplicate with 250 ng/ml rmIL-15 for the indicated time points at 37°C. Cell-free supernatants were collected and analyzed by ELISA for the production of RANTES. Data are shown as mean ± SEM. (D) Bone marrow cells from one Rag2−/−γc−/− mice were seeded in triplicate at 3 × 106 cells/well and left untreated or stimulated with rmIL-15 (250 ng/ml) for 2, 4, and 6 h. cDNA was synthesized from total RNA, and the expression level of RANTES mRNA was determined by quantitative RT-PCR. The expression level of RANTES relative to the level of 18S rRNA is indicated. Three independent experiments were performed with similar results, with data shown as mean ± SEM. Statistical significance is indicated with respect to media alone. *p < 0.05, **p < 0.01, *** p < 0.001. The ability of IL-15 to signal in the absence of γc to induce RANTES production by Rag2−/−γc−/− bone marrow cells prompted us to ask if the presence of γc would enhance bone marrow cell responsiveness to IL-15 and lead to increased RANTES production. To address this, we incubated adherent bone marrow cells from Rag2−/−γc−/− mice and wild-type BALB/c mice with increasing concentrations of IL-15 and measured RANTES production by ELISA. Interestingly, we observed a similar pattern of RANTES production by adherent bone marrow cells from both strains of mice, and no significant differences in RANTES production between strains were observed after the administration of 250 and 500 ng/ml IL-15 (p > 0.05) (Fig. 3A). γc does not increase bone marrow cell sensitivity to IL-15, and IL-15/IL-2Rβ signaling is not required for IL-15–mediated RANTES production by Rag2−/−γc−/− bone marrow cells. (A) Adherent bone marrow cells from female Rag2−/−γc−/− mice (n = 3) and wild-type BALB/c mice (n = 3) were seeded at 3 × 105 cells/well and stimulated in triplicate with the indicated concentrations of rmIL-15 for 24 h at 37°C. Cell-free supernatants were collected and analyzed by ELISA for the production of RANTES. (B) Bone marrow cells from female Rag2−/−γc−/− mice (n = 3) were seeded at 3 × 105 cells/well and preincubated with 20 μg/ml anti-IL-15/IL-2Rβ blocking mAb for 30 min at room temperature. Cells then were treated in triplicate with 250 ng/ml rmIL-15 for 24 h at 37°C, and cell-free supernatants were collected and analyzed for the production of RANTES by ELISA. Results are representative of two independent experiments. Data are expressed as mean ± SEM. We next used Ab blockade of IL-15/IL-2Rβ signaling in Rag2−/−γc−/− bone marrow cells to determine whether IL-15/IL-2Rβ is required for IL-15–mediated RANTES production. Interestingly, there was no inhibition (p > 0.05) of IL-15–mediated RANTES production by Rag2−/−γc−/− bone marrow cells pretreated with the anti-IL-15/IL-2Rβ Ab (TM-β1 clone) (Fig. 3B). Experiments were performed to confirm the blocking function of the Ab (Supplemental Fig. 1). Because we observed that IL-15 can induce RANTES production independent of the IL-15/IL-2Rβ and γc chains, next we wanted to determine whether IL-15Rα signaling is required for IL-15–mediated RANTES production by Rag2−/−γc−/− bone marrow cells. We first incubated Rag2−/−γc−/− bone marrow cells with soluble rmIL-15/rmIL-15Rα complexes containing 250 ng/ml rmIL-15 and increasing concentrations of soluble rmIL-15Rα. This was completed to saturate IL-15 binding sites for IL-15Rα, theoretically blocking IL-15 signaling through cell surface-bound IL-15Rα. We observed markedly decreased RANTES production (p < 0.01) in cells incubated with any of the concentrations of rmIL-15/rmIL-15Rα complexes (Fig. 4A). Interestingly, the preincubation of Rag2−/−γc−/− bone marrow cells with an anti-IL-15Rα Ab also decreased RANTES production by these cells (Fig. 4B). We then performed knockdown of IL-15Rα with shRNA using a lentiviral vector. We first examined five IL-15Rα lentivirus constructs, of which two constructs (A11 and B2) showed significant reductions of IL-15Rα expression in Rag2−/−γc−/− bone marrow cells using FACS analysis (Fig. 4C). We then used A11 and B2 lentiviral shRNA constructs for the knockdown experiments. Suppression of IL-15Rα resulted in a significant reduction in IL-15–mediated RANTES production by Rag2−/−γc−/− bone marrow cells (p < 0.05) (Fig. 4D). IL-15Rα is required for IL-15–mediated RANTES production by Rag2−/−γc−/− bone marrow cells. (A) Bone marrow cells from female Rag2−/−γc−/− mice (n = 5) were seeded at 3 × 105 cells/well and incubated with the indicated concentrations of rmIL-15, rmIL-15Rα, or soluble rmIL-15/rmIL-15Rα complexes for 24 h at 37°C. Cell-free supernatants were collected and analyzed for the production of RANTES by ELISA. *p < 0.05, **p < 0.01, ***p < 0.001 compared with 250 ng/ml IL-15 alone. (B) Bone marrow cells from female Rag2−/−γc−/− mice (n = 3) were seeded at 3 × 105 cells/well and preincubated with 20 μg/ml anti-IL-15Rα mAb or control Ig for 30 min at room temperature. Cells then were treated in triplicate with 250 ng/ml rmIL-15 for 24 h at 37°C, and cell-free supernatants were collected and analyzed for the production of RANTES by ELISA. *p < 0.05. (C) Lentiviral vector-infected Rag2−/−γc−/− bone marrow cells were stimulated with rmIL-15 and then incubated with PE-Cy7–labeled anti-CD11b Ab and carboxyfluorescein-labeled anti-IL-15Rα Ab. Cells were analyzed by flow cytometry, and IL-15Rα expression was quantified according to FMO staining controls. (D) Bone marrow cells from Rag2−/−γc−/− mice (n = 5) were cultured in 24-well tissue culture plates at a concentration of 5 × 105 cells/ml. Cells were infected with lentiviral vector containing murine IL-15Rα shRNA (A11 and B2) or scrambled shRNA (Scrmbl), or control vectors (Vec) at a multiplicity of infection of 1.0 at 37°C for 16 h. The culture plates were washed to remove the remaining virus, replaced with fresh medium, and stimulated with rmIL-15 (250 ng/ml) for 24 h. Experiments were performed twice. Cell-free supernatants were collected and measured for RANTES production by ELISA. *p < 0.05 compared with Vec + IL-15 and Scrmbl + IL-15. All of the experiments repeated at least twice. It is well established that Jak/STAT signaling is essential for IL-15 signaling via IL-15/IL-2Rβ/γc (9, 13, 17–19). We used the Jak/STAT signaling inhibitor Jak Inhibitor I [also known as pyridone 6 (P6)] to investigate whether Jak/STAT signaling is important for IL-15 signaling in Rag2−/−γc−/− bone marrow cells. Interestingly, preincubation with P6 did not decrease IL-15–mediated RANTES production (p > 0.05) by Rag2−/−γc−/− bone marrow cells (Fig. 5A). Experiments to confirm that P6 is functional in our system were performed (Supplemental Fig. 2). JNK and NF-κB signaling, but not Jak/STAT signaling, are required for IL-15–mediated RANTES production by Rag2−/−γc−/− bone marrow cells. (A) Adherent bone marrow cells from Rag2−/−γc−/− mice (n = 3) were seeded at 3 × 105 cells/well and preincubated with 10 μM P6 for 2 h at 37°C. Cells were treated in triplicate with 250 ng/ml rmIL-15 for 24 h at 37°C, and supernatants were analyzed for the production of RANTES by ELISA. Experiments were performed twice. Data are shown as mean ± SEM. (B) Rag2−/−γc−/− bone marrow cells were seeded at 3 × 105 cells/well and preincubated with 10 μM SP600125 (SP10uM) and 25 μM SP600125 (SP25uM) for 2 h at 37°C . Cells were treated in triplicate with 250 ng/ml rmIL-15 for 24 h at 37°C, and supernatants were analyzed for the production of RANTES by ELISA. Experiments were performed twice with representative data from one mouse shown. (C) Bone marrow cells from female Rag2−/−γc−/− mice (n = 3) were seeded at 3 × 105 cells/well and preincubated with 10 μM BAY 11-7082 for 30 min at 37°C. Cells were treated in triplicate with 250 ng/ml rmIL-15 for 24 h at 37°C, and supernatants were collected and analyzed for the production of RANTES by ELISA. Experiments were performed twice (each time with triplicates from each mouse), with data shown as mean ± SEM. ***p < 0.001. Because IL-15 has been shown previously to signal through MAPKs in myeloid cells (reviewed in Ref. 9), we next chose to examine whether p38, ERK1/2, and/or JNK are required for IL-15–mediated RANTES production by myeloid cells. Using selective inhibitors for each pathway, we observed markedly attenuated IL-15–mediated RANTES production by Rag2−/−γc−/− bone marrow cells and RAW264.7 macrophages pretreated with SP600125, a selective JNK inhibitor (p < 0.001) (Fig. 5B, Supplemental Fig. 3). In contrast, inhibition of p38 and MEK1/2 did not decrease IL-15–mediated RANTES production by Rag2−/−γc−/− bone marrow cells and RAW264.7 macrophages (Supplemental Fig. 3). Because independent reports indicate that IL-15 is able to induce NF-κB activation (17) and NF-κB activation stimulates the production of RANTES (29–31), we next used the NF-κB signaling inhibitor BAY 11-7082 to investigate whether NF-κB signaling is important for IL-15–mediated RANTES production by Rag2−/−γc−/− bone marrow cells. BAY 11-7082 has been shown to reduce NF-κB signaling through the inhibition of cytokine-induced phosphorylation of IκB-α (32). Increasing doses of BAY 11-7082 caused dose-dependent decreases in LPS-mediated RANTES production and TNF-α production by adherent bone marrow cells from wild-type BALB/c mice (Supplemental Fig. 4). Interestingly, pretreatment of Rag2−/−γc−/− bone marrow cells with 10 μM BAY 11-7082 caused a dramatic decrease in IL-15–mediated RANTES production by these cells (p < 0.001) (Fig. 5C). We then chose to examine whether IL-15 is able to induce NF-κB nuclear translocation in Rag2−/−γc−/− bone marrow cells. Bone marrow cells were treated with LPS (as a positive control) or IL-15 for the indicated time points, stained for immunofluorescence, and analyzed by confocal microscopy for nuclear translocation of the p65 NF-κB subunit. Treatment for 1 h with LPS and for 4 h with IL-15 induced NF-κB nuclear translocation in Rag2−/−γc−/− bone marrow cells (Fig. 6A). We observed no nuclear translocation of NF-κB after treatment with IL-15 for 0.5, 1, or 2 h (Fig. 6A). NF-κB nuclear translocation also was blocked significantly in cells treated with soluble IL-15/IL-15Rα complexes and in cells pretreated with anti-IL-15Rα Ab (Fig. 6A). Finally, by Western blot analysis, we confirmed NF-κB nuclear translocation in Rag2−/−γc−/− bone marrow cells after 2, 4, and 6 h of IL-15 treatment (Fig. 6B). Confocal microscopy and Western blot analysis confirm the requirement for NF-κB for IL-15–mediated RANTES production by Rag2−/−γc−/− bone marrow cells. (A) Rag2−/−γc−/− bone marrow cells were seeded at 5 × 105 cells/well in a 12-well plate and stimulated with 100 ng/ml LPS, 250 ng/ml IL-15, or 250 ng/ml IL-15 for the indicated time points. Additional treatment groups consisted of 250 ng/ml IL-15 + 500 ng/ml IL-15Rα for 4 h and incubation with mouse IL-15Rα Ab (R&D Systems) for 1 h followed by stimulation with rmIL-15 (250 ng/ml) for 4 h. Cells were transferred onto slides, blocked, and incubated with anti-NF-κB primary Ab and fluorescent secondary Ab. Cells were counterstained for nuclei and analyzed by confocal microscopy. Experiments were performed twice with representative data from one mouse shown. Original magnification ×1260. (B) Bone marrow cells isolated from one Rag2−/−γc−/− mouse were mock-treated or stimulated with rmIL-15 (250 ng/ml) for 2, 4, and 6 h, and the nuclear protein extracts (6–10 × 106 cells/treatment) were separated by 10% SDS-PAGE and immunoblotted with anti-NF-κB p65 Ab. Equal amount of protein loading was verified by stripping and reprobing the membrane with mouse anti-β-actin Ab. Results are representative of three repeated experiments. It has been reported that IL-15 complexed with soluble IL-15Rα significantly increases its function on NK and CD8+ T cells (4, 14–16). In this study, we examined whether IL-15 trans presentation is important for IL-15–mediated RANTES production by Rag2−/−γc−/− bone marrow cells. The incubation of Rag2−/−γc−/− bone marrow cells with soluble IL-15/IL-15Rα complexes led to a significant decrease (p < 0.001) in RANTES production compared with that with stimulation with IL-15 alone (Fig. 4A, 7A). In contrast, the incubation of purified murine NK cells with soluble IL-15/IL-15Rα complexes led to a significant increase (p < 0.001) in IFN-γ production over IL-15 treatment alone (Fig. 7B). IL-15 trans presentation inhibits IL-15–mediated RANTES production by Rag2−/−γc−/− bone marrow cells but enhances IL-15–mediated IFN-γ production by NK cells. (A) Rag2−/−γc−/− bone marrow cells (from three mice) were seeded at 3 × 105 cells/ml in 96-well tissue culture plates and stimulated with rmIL-15, rmIL-15Rα, and soluble rmIL-15/rmIL-15Rα complexes at the indicated concentrations for 24 h at 37°C. (B) Purified NK cells from BALB/c or B6 (n = 5) mice were seeded at 2 × 105 cells/well in 96-well tissue culture plates and similarly stimulated with rmIL-15, rmIL-15Rα, and soluble rmIL-15/rmIL-15Rα complexes for 24 h at 37°C. Cell-free supernatants from bone marrow cells and NK cells were collected and assayed for RANTES and IFN-γ production, respectively, by ELISA. Experiments were performed three times with similar results. ***p < 0.001. The dominant mechanism of IL-15 signaling in vivo in NK cells and memory CD8+ T cells is trans presentation, whereby accessory cells present IL-15 bound to IL-15Rα in trans to NK cells and memory CD8+ T cells expressing IL-15/IL-2Rβ and γc (1, 2, 15). To date, relatively few studies have been performed that address the mechanisms governing the effects of IL-15 on myeloid cells. In this study, we have demonstrated that IL-15 can signal in myeloid cells in the absence of γc. We performed a series of experiments to confirm that IL-15 can signal via IL-15Rα, but not IL-15/IL-2Rβ, in the absence of γc. Our data provide evidence that IL-15 signaling is different in myeloid cells compared with that in NK and T cells. Whereas soluble IL-15Rα complexed with IL-15 significantly increases the activity of IL-15 in NK and T cells, IL-15/IL-15Rα complexes dramatically reduce the activities of IL-15 on myeloid cells. On the basis of previous reports highlighting the importance of IL-15 and IL-15Rα signaling for IL-15–mediated RANTES production (8, 24), we examined whether IL-15 stimulation induces RANTES production by myeloid cells from Rag2−/−γc−/− mice. We focused on the bone marrow as a source of myeloid cells from these mice (∼20 million cells/mouse, virtually all CD11b+GR-1+) as compared with spleen (∼1 million cells/mouse). Using quantitative RT-PCR, we observed significant IL-15–mediated induction of RANTES mRNA in Rag2−/−γc−/− bone marrow cells beginning at 2 h, which peaked after 4 h of IL-15 treatment. By 6 h, the IL-15–mediated induction in RANTES mRNA sharply declined to the basal levels. At the protein level, RANTES was induced significantly after 6 and 8 h of IL-15 treatment but not at earlier time points, suggesting that IL-15 transcriptionally activates the RANTES gene, leading to de novo synthesis of RANTES protein by these cells. RANTES, also known as CCL5, was described originally as a T cell-specific factor (33) and induces the homing of T cells, monocytes, NK cells, DCs, and mast cells to sites of inflammation (34). More recently, additional cell types have been shown to produce RANTES, including macrophages, platelets, epithelial cells, fibroblasts, and vascular smooth muscle cells (29, 34). RANTES was produced at similar levels by wild-type, Rag2−/−, and Rag2−/−γc−/− bone marrow cells after IL-15 administration, suggesting that the presence of γc does not increase bone marrow cell responsiveness to IL-15. Through the use of an anti-CD122 Ab, we also demonstrated that IL-15/IL-2Rβ appears not to be involved in IL-15–mediated RANTES production by Rag2−/−γc−/− bone marrow cells. This is in striking contrast to the requirement for IL-15/IL-2Rβ for IL-15 signaling in NK cells and CD8+ T cells (2, 11–13). After ruling out the involvement of IL-15/IL-2Rβ and γc signaling, we next examined whether IL-15Rα signaling is required for IL-15–mediated RANTES production by Rag2−/−γc−/− bone marrow cells. The markedly decreased IL-15–mediated RANTES production by Rag2−/−γc−/− bone marrow cells incubated with rmIL-15/rmIL-15Rα complexes, anti-IL-15Rα Ab, and IL-15Rα shRNA clearly demonstrates the importance of IL-15Rα for IL-15 signaling in myeloid cells in the absence of γc. Indeed, the importance of IL-15Rα for IL-15 signaling in myeloid cells, including neutrophils, has been documented previously (35). We next examined whether Jak/STAT signaling promotes IL-15–mediated RANTES production by Rag2−/−γc−/− bone marrow cells. We observed no impairment in IL-15–mediated RANTES production by Rag2−/−γc−/− bone marrow cells after the preincubation of cells with P6, suggesting that Jak/STAT activation is not required. Conversely, the inhibition of JNK signaling completely blocked IL-15–mediated RANTES production by Rag2−/−γc−/− bone marrow cells. Although the number of reports regarding IL-15 and JNK signaling are limited, IL-15 has been shown to induce JNK activation in PBMCs (20). In addition, JNK signaling was shown recently to be critical for regulating RANTES transcription by human NK cells (36). Because transcriptional activation of the RANTES promoter has been shown previously to occur through the binding of NF-κB to κB elements of the RANTES promoter (29, 30), we next chose to examine whether NF-κB signaling is required for IL-15–mediated RANTES production by Rag2−/−γc−/− bone marrow cells. Several reports also have demonstrated the ability of IL-15 signaling to induce NF-κB activation (7, 17, 21). After incubation with BAY 11-7082, which reduces NF-κB signaling through the inhibition of cytokine-induced phosphorylation of IκB-α (32), we observed dramatically reduced IL-15–mediated RANTES production by Rag2−/−γc−/− bone marrow. We also observed NF-κB nuclear translocation in Rag2−/−γc−/− bone marrow cells after 4 h of stimulation with IL-15 using confocal microscopy and Western blot analysis. The observed delay in NF-κB activation prompted us to ask whether IL-15 signaling in Rag2−/−γc−/− bone marrow cells results in the release of a soluble factor that signals back on Rag2−/−γc−/− bone marrow cells to mediate NF-κB activation. We repeated this experiment using the protein transport inhibitor BD GolgiStop; however, we observed NF-κB p65 nuclear translocation in cells treated with both IL-15 and BD GolgiStop for 4 h, suggesting that this is not the case. Importantly, incubation with anti-IL-15Rα Ab blocked the IL-15–mediated nuclear translocation of NF-κB. Thus, IL-15–mediated RANTES production by Rag2−/−γc−/− bone marrow cells requires IL-15Rα and JNK signaling, as well as NF-κB activation. Although future work is required to elucidate how IL-15 triggers this activation through IL-15Rα, JNK and NF-κB were shown recently to exhibit parallel patterns of regulation in murine macrophages (37), and JNK and NF-κB signaling pathways have been shown previously to diverge at the level of TNFR-associated factor-2 (38). The majority of IL-15 signaling studies published to date focus on the trans presentation of IL-15 to NK cells and CD8+ T cells. The administration of soluble IL-15/IL-15Rα complexes to mimic IL-15 trans presentation has been shown to positively regulate human NK cell proliferation and activation in humanized immune system mice in vivo (4). Indeed, we showed here that the delivery of soluble IL-15/IL-15Rα complexes to NK cells enhanced IL-15–mediated IFN-γ production by these cells. In striking contrast, the delivery of soluble IL-15/IL-15Rα complexes to Rag2−/−γc−/− myeloid bone marrow cells markedly inhibited IL-15–mediated RANTES production, suggesting that IL-15 trans presentation is not important for IL-15 signaling in macrophages and that a separate IL-15 signaling paradigm may exist in myeloid cells. In this study, we have demonstrated for the first time to our knowledge that IL-15 can signal in a population of myeloid cells in the absence of γc. IL-15 stimulation of Rag2−/−γc−/− bone marrow cells induces RANTES production by these cells and occurs independently of IL-15/IL-2Rβ and Jak/STAT signaling and instead requires IL-15Rα, JNK, and NF-κB activation. Future studies investigating the mechanism of IL-15 signaling in myeloid cells may reveal novel IL-15 signaling paradigms. It is our ultimate view that additional insights into the biology of IL-15 and IL-15R will lead to the development of improved immunotherapies aimed at bolstering immune responses against cancer and infectious disease. M.J.C., M.F.M., and N.G.B. performed experiments; M.J.C. and M.F.M. analyzed data; M.J.C. and A.A.A. wrote the paper; T.A. and N.S. generated all of the reagents for short hairpin RNA experiments; J.B. provided critical advice and suggestions; B.D.L. and A.M. provided reagents; A.M. provided consultations; and A.A.A. designed the experiments. This work was supported by a grant from the Canadian Institutes of Health Research to A.A.A. A.A.A. is a recipient of a career award from Research-Based Pharmaceutical Companies/Canadian Institutes of Health Research. M.J.C. was the recipient of an Alexander Graham Bell Canada Graduate Scholarship from the Natural Sciences and Engineering Research Council of Canada.
. 2009. Macrophage- and dendritic-cell-derived interleukin-15 receptor alpha supports homeostasis of distinct CD8+ T cell subsets. Immunity 31: 811–822.
. 2010. Trans-presentation: a novel mechanism regulating IL-15 delivery and responses. Immunol. Lett. 127: 85–92.
. 2009. Trans-presentation of IL-15 by intestinal epithelial cells drives development of CD8alphaalpha IELs. J. Immunol. 183: 1044–1054.
. 2009. IL-15 trans-presentation promotes human NK cell development and differentiation in vivo. J. Exp. Med. 206: 25–34.
. 2001. Critical role of IL-15-IL-15R for antigen-presenting cell functions in the innate immune response. Nat. Immunol. 2: 1138–1143.
. 2005. Survival adjustment of mature dendritic cells by IL-15. Proc. Natl. Acad. Sci. USA 102: 8662–8667.
. 2006. Differential effects of IL-15 and IL-21 in myeloid (CD11b+) and lymphoid (CD11b-) bone marrow cells. J. Immunol. 177: 100–108.
. 2010. Interleukin-15 enhances proliferation and chemokine secretion of human follicular dendritic cells. Immunology 130: 536–544.
. 2006. IL-15/IL-15 receptor biology: a guided tour through an expanding universe. Cytokine Growth Factor Rev. 17: 259–280.
. 2007. Crystal structure of the IL-15-IL-15Ralpha complex, a cytokine-receptor unit presented in trans. Nat. Immunol. 8: 1001–1007.
. 1994. Utilization of the beta and gamma chains of the IL-2 receptor by the novel cytokine IL-15. EMBO J. 13: 2822–2830.
. 2002. IL-15Ralpha recycles and presents IL-15 In trans to neighboring cells. Immunity 17: 537–547.
. 1995. Tyrosine phosphorylation and activation of STAT5, STAT3, and Janus kinases by interleukins 2 and 15. Proc. Natl. Acad. Sci. USA 92: 8705–8709.
. 2007. 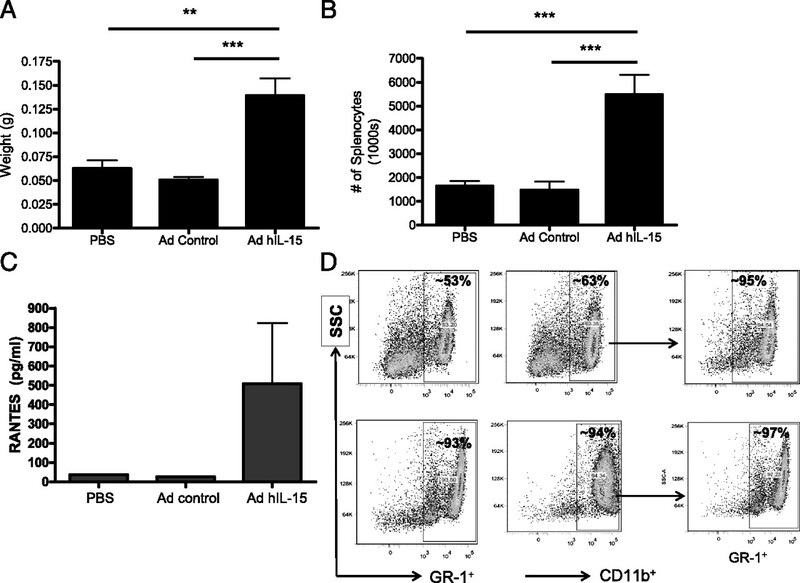 Dendritic cells prime natural killer cells by trans-presenting interleukin 15. Immunity 26: 503–517.
. 2008. IL-15Ralpha chaperones IL-15 to stable dendritic cell membrane complexes that activate NK cells via trans presentation. J. Exp. Med. 205: 1213–1225.
. 2004. Coordinate expression and trans presentation of interleukin (IL)-15Ralpha and IL-15 supports natural killer cell and memory CD8+ T cell homeostasis. J. Exp. Med. 200: 825–834.
. 2003. Differential STAT3, STAT5, and NF-kappaB activation in human hematopoietic progenitors by endogenous interleukin-15: implications in the expression of functional molecules. Blood 102: 109–117.
. 2001. Interleukin 15: biology and relevance to human disease. Blood 97: 14–32.
. 2008. Inhibition of tumor growth by NK1.1+ cells and CD8+ T cells activated by IL-15 through receptor beta/common gamma signaling in trans. J. Immunol. 181: 8237–8247.
. 2007. Inhibition of TGF-beta signaling by IL-15: a new role for IL-15 in the loss of immune homeostasis in celiac disease. Gastroenterology 132: 994–1008.
. 2002. Interleukin-15 inhibits spontaneous apoptosis in human eosinophils via autocrine production of granulocyte macrophage-colony stimulating factor and nuclear factor-kappaB activation. Am. J. Respir. Cell Mol. Biol. 26: 404–412.
. 1997. Interleukin-15 (IL-15) induces IL-8 and monocyte chemotactic protein 1 production in human monocytes. Blood 90: 2804–2809.
. 1997. 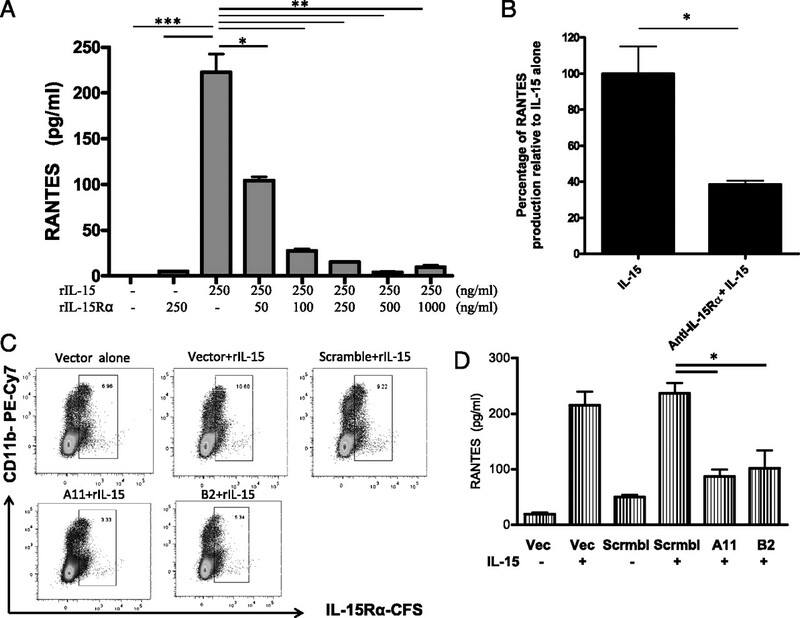 IL-15 functions as a potent autocrine regulator of macrophage proinflammatory cytokine production: evidence for differential receptor subunit utilization associated with stimulation or inhibition. J. Immunol. 159: 2941–2951.
. 2005. Reduced 2,4-dinitro-1-fluorobenzene-induced contact hypersensitivity response in IL-15 receptor alpha-deficient mice correlates with diminished CCL5/RANTES and CXCL10/IP-10 expression. Eur. J. Immunol. 35: 690–698.
. 1999. IL-15 induces the expression of chemokines and their receptors in T lymphocytes. J. Immunol. 162: 2606–2612.
. 2005. NK and NKT cell-independent contribution of interleukin-15 to innate protection against mucosal viral infection. J. Virol. 79: 4470–4478.
. 2010. IL-15 has innate anti-tumor activity independent of NK and CD8 T cells. J. Leukoc. Biol. 88: 529–536.
. 2009. Exposure to cigarette smoke suppresses IL-15 generation and its regulatory NK cell functions in poly I:C-augmented human PBMCs. Mol. Immunol. 46: 3108–3116.
. 2010. Stat3-dependent acute Rantes production in vascular smooth muscle cells modulates inflammation following arterial injury in mice. J. Clin. Invest. 120: 303–314.
. 2007. Unphosphorylated STAT3 accumulates in response to IL-6 and activates transcription by binding to NFkappaB. Genes Dev. 21: 1396–1408.
. 1997. Nuclear factor-kappa B potently up-regulates the promoter activity of RANTES, a chemokine that blocks HIV infection. J. Immunol. 158: 3483–3491.
. 1997. Novel inhibitors of cytokine-induced IkappaBalpha phosphorylation and endothelial cell adhesion molecule expression show anti-inflammatory effects in vivo. J. Biol. Chem. 272: 21096–21103.
. 1988. A human T cell-specific molecule is a member of a new gene family. J. Immunol. 141: 1018–1025. 2009. The unexpected pleiotropic activities of RANTES. J. Immunol. 182: 3945–3946.
. 2004. 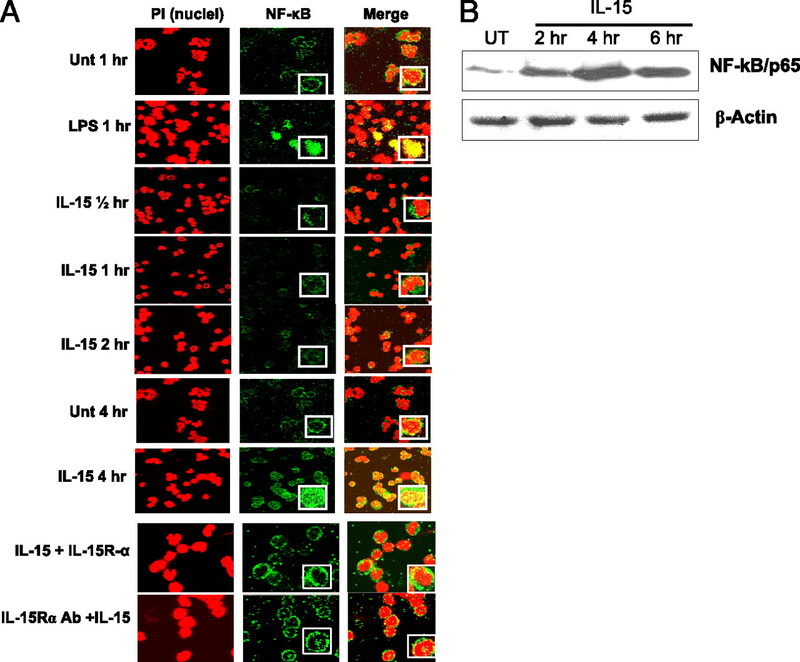 Interleukin-15 enhances human neutrophil phagocytosis by a Syk-dependent mechanism: importance of the IL-15Ralpha chain. J. Leukoc. Biol. 76: 162–168.
. 2009. JNK MAPK pathway regulates constitutive transcription of CCL5 by human NK cells through SP1. J. Immunol. 182: 1011–1020.
. 2010. MCP-induced protein 1 deubiquitinates TRAF proteins and negatively regulates JNK and NF-kappaB signaling. J. Exp. Med. 207: 2959–2973.
. 1997. Tumor necrosis factor (TNF)-mediated kinase cascades: bifurcation of nuclear factor-kappaB and c-jun N-terminal kinase (JNK/SAPK) pathways at TNF receptor-associated factor 2. Proc. Natl. Acad. Sci. USA 94: 9792–9796.